Once it sat prominently in the corner of the living room, looming over the family gathered around it. But it seems that as our homes become less formal and our furniture gains a lower profile, our televisions are having to change too. 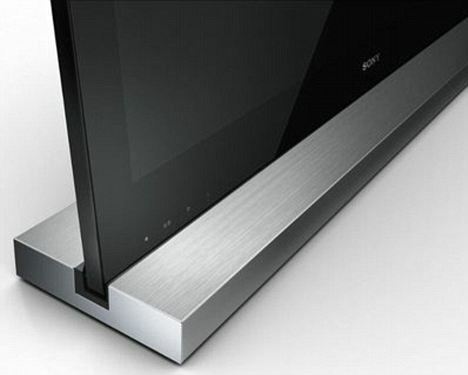 Electronics giant Sony has launched what is billed as the world’s first tilting screen after experts calculated the best angle for comfortable viewing. Apparently a slight backwards lean of six degrees is now the best position for a television set as so many of us mount modern flat-screens on low-level furniture. The new range can be slotted into the tilting position to achieve what its makers say is the optimum picture as we slump down on our increasingly plush, comfortable sofas. It comes as design experts say we are increasingly choosing glossy, shiny TV screens which complement our homes’ style even when they are switched off. The ‘Monolithic’ screens, which start at £1,300 for a 40-inch screen and are available in state-of-the art 3D models, can either be set up vertically or slotted to a six-degree backwards lean. 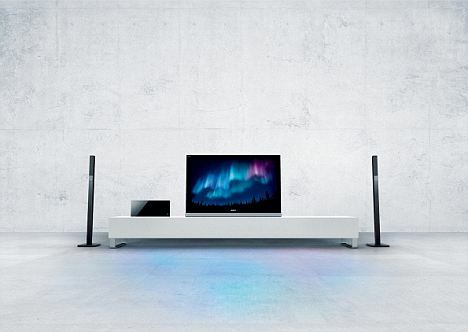 ‘Most people don’t put their televisions at waist height any more, they set them up a foot or two off the ground,’ said Tim Page, Sony Europe’s senior manager of technology marketing. ‘With more minimalist, uncluttered styles for furniture it suits the trend to site the television where it’s in a less obtrusive position. ‘It’s part of a wider trend for lower level furniture, but with a conventional screen it can mean you’re effectively looking down at the picture. ‘For an optimum image in terms of contrast and colours, you need to look at it square-on, and that’s where the tilting function comes in. Sony researchers say a six degree lean is the ideal angle – any less doesn’t make much of a discernible difference, and any more could lead to reflections from ceiling lights getting in the way. They hope the tilting screens will give them the edge in the fast-changing television market in which design pundits say style and presence are now considerations every bit as important as picture quality. And in more and more households, the trend is for ‘living lower’, with furniture sitting closer to the ground than ever before, so as the centrepiece of many living rooms the television has to match. Researchers commissioned by Sony found that almost three-quarters of people couldn’t conceive of giving up their tellies, and discovered we are becoming increasingly recumbent when watching them. Comfort viewing: Most families recline in front of their television Sitting with your feet up has become socially acceptable, they said, and six out of ten admit watching programmes lying on their sofas while five per cent simply sit on the floor. 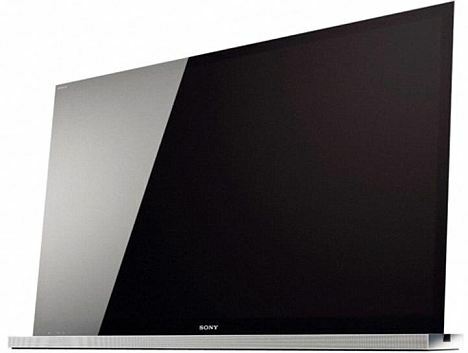 However Sony currently has no plans to produce a forward-tilting screen for those who prefer a carpet-level viewing position. The range of tilting screens runs to a 55in model priced at £3,000.